From the endlessly imaginative head of Rod Serling, Night Gallery was the early 70s follow up to the mammoth success of The Twilight Zone TV series. 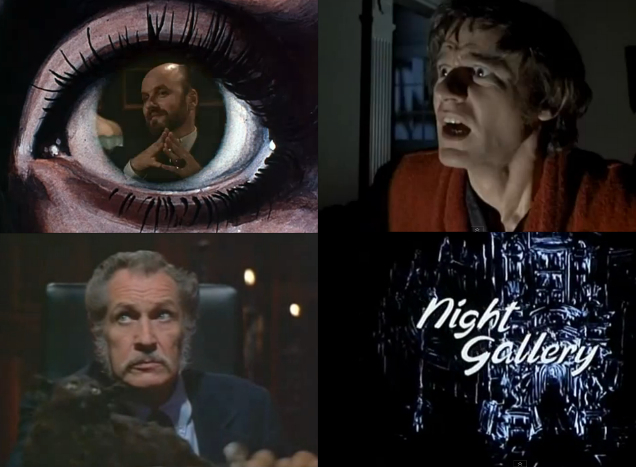 Both inhabited similar territory – anthologies of stories from the other side that included fractured morality fables, surreal sci-fi, dream-like mysteries, macabre fantasy twists – but the Night Gallery had a dose more horror suited to those occult-obsessed times. It also had a dose of fantastic guest stars, not least among them Vincent Price, Roddy McDowall, Joan Crawford and Elsa Lanchester, with a bonus helping of John Astin, who popped up in several episodes. The moreishness of the series lay as much though in the variety of the narratives, which could reach the height of literary adaptation (Conrad Aiken's Silent Snow, Secret Snow) or plummet to the delightfully gory depths of sheer pulp (Adam West on how to mix a martini in With Apologies To Mr Hyde). You really never knew what the next canvas would reveal in Serling's gallery of the bizarre. For those whose whistle has been whetted, Rod Serling's Night Gallery has more about the episodes, show and the accompanying book.